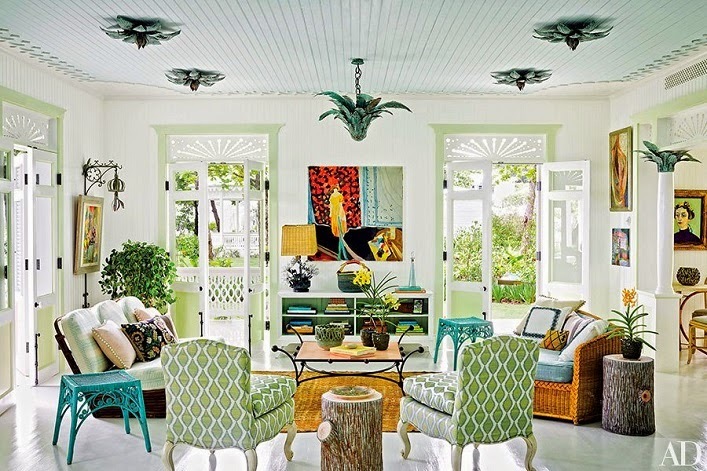 Mix and Chic: Home tour- Designer Celerie Kemble's beachfront Dominican Republic retreat! 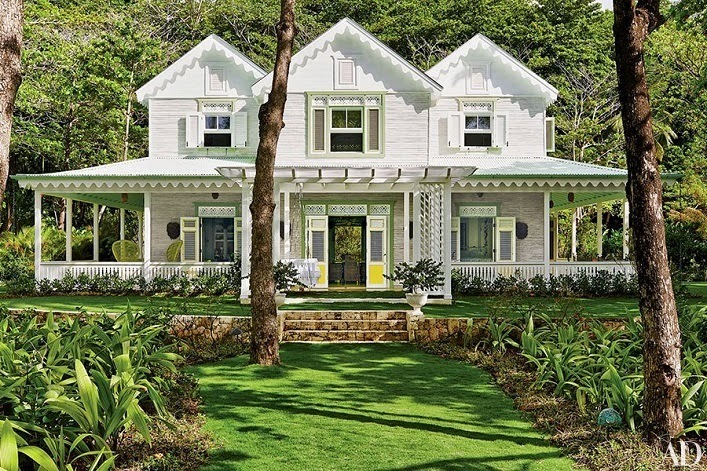 Home tour- Designer Celerie Kemble's beachfront Dominican Republic retreat! 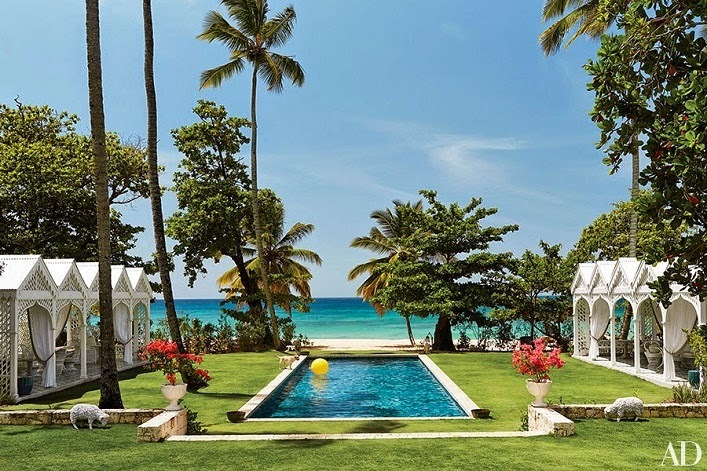 This fabulous beachfront Dominican Republic retreat belongs to designer Celerie Kemble that she shares with her husband and three children. 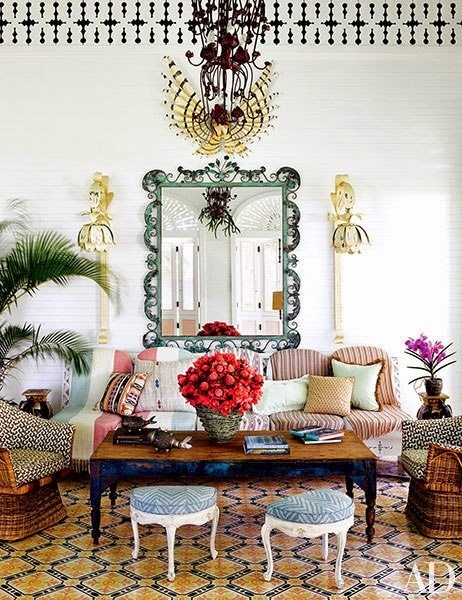 With 22-foot high ceilings, a soft color palette, beautiful latticework, fancy fretwork and the occasional odd metal furnishings, this oceanfront home becomes a whimsical paradise. Let's check out this fun and lively home, shall we? There is just something so delightful and refreshing about this home, don't you think? The old cabana paintings that frame the folding doors in the dining room had me do a double take, it was so quirky and unexpected, which I totally love! Also, did you notice the concrete sheep near the swimming pool? They look so natural and adorable! I think the designer really did a great job pushing the envelope and coming up with something totally different and inspiring for this home! The bright and charming bedroom is my favorite! I absolutely enjoyed this tour, what about you? Thoughts? It is colorful and full of life...those sheep are adorable! OMG, outside and in, this house is marvelous! Playful yet classy fun! I can't imagine leaving this home!